These tiny bryophytes reveal their beauty slowly and up close, as do good friends. Prior to the development of the first efficient microscopes in the late eighteenth century, most people, including scientists, regarded hornworts, liverworts, and mosses as tiny flowering plants. 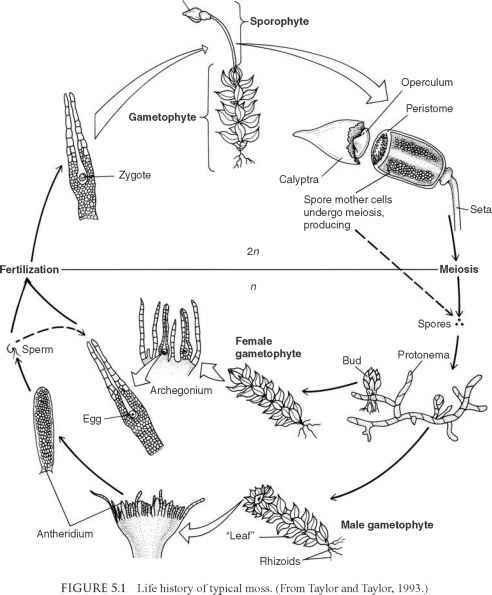 The distinctness of these organisms first became widely acknowledged in the decades following the documentation of the bryophyte life cycle (FIG. 5.1) by Wilhelm Hofmeister (FIG. 5.2 ) in 1851. Beginning in the twentieth century, scientists became increasingly interested in the origin and evolution (including the fossil record) of the hornworts and bryophytes, and their relationships to other groups of fossil and modern plants. Bryophytes and hornworts are unique among extant embryophytes in that they have a gametophyte-dominant life cycle; the sporophyte usually is relatively short lived and permanently dependent upon the gametophyte. Physiologically, they are poikilohydric, meaning that they cannot control water loss; when the environment dries out, bryophytes also desiccate. Some are reported with endomycorrhizae (e.g., Y. Zhang and Guo, 2007). When moisture is available, they rehydrate; in other words, desiccation tolerance is physiological and not structural, as it is in most vascular plants. 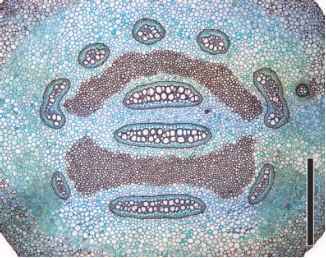 The plant body in these groups is a thallus—a simple plant body which is not differentiated into stems, roots, and leaves. Although they have no vascular tissue, some bryophytes have conducting cells in the form of hydroids and leptoids. Hornworts and liverworts have been interpreted as occupying a position intermediate between the green algae and vascular plants (Smith, 1938). Others suggested that the bryophytes in general represented examples of evolutionary failures; perhaps they originated from early vascular plants, such as the rhyniophytes (Chapter 8), and then, as the group continued to evolve, vascular tissue was lost. Today, however, these views have changed on the basis of a variety of ultrastructural, biochemical, and molecular data (Duckett and Renzaglia, 1988) suggesting that the principal bryophyte groups had separate origins, and that hornworts, liverworts, and mosses represent the earliest divergent lineages of extant land plants, although the specific order of their divergence still remains unresolved (Friedman et al., 2004; Shaw and Renzaglia, 2004). Phylogenetic analysis strongly supports the liverworts as sister to all other land plants, and provides moderate to strong support for hornworts as the sister group to the vascular plants (Nickrent et al., 2000; Qui et al., 2006). modern genera do not appear until the Cretaceous. Hornworts are not encountered until the Cretaceous, and their occurrence is based almost exclusively on dispersed spores (N. Miller, 1980). The majority of Cenozoic bryo-phytes are assignable to modern genera, which may indicate that most of the modern families arose during the Cretaceous. Frey (1990) suggested that most of the leafy liverwort taxa as well as some mosses may have evolved in southern Gondwana and migrated north into tropical and Laurasian regions during the Cretaceous and Cenozoic.